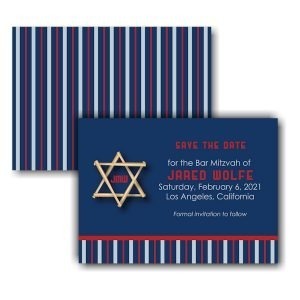 This festive save the date card is digitally printed on premium 110# Pearl Ice Metallic Shimmer stock. 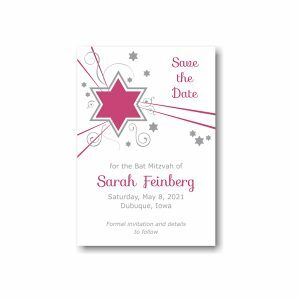 A Jewish Star of David motif in Fuchsia Rose ink appears in the upper left corner and is surrounded by silver stars and swirls and fuchsia streamers. This festive save the date card is digitally printed on premium 110# Pearl Ice Metallic Shimmer stock. 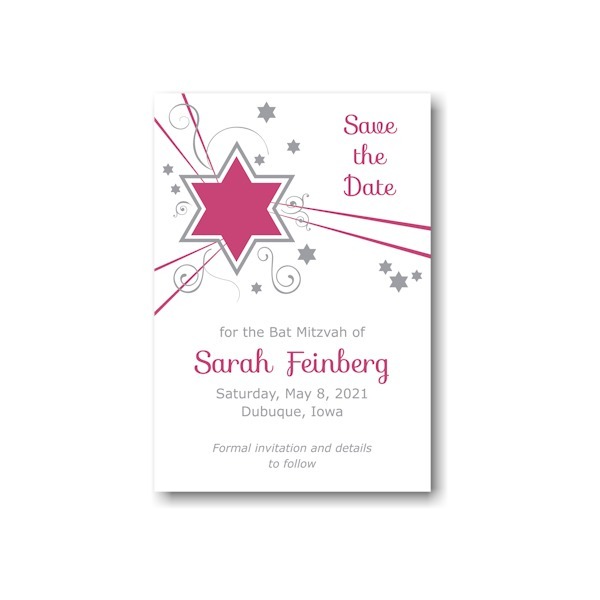 A Jewish Star of David motif in Fuchsia Rose ink appears in the upper left corner and is surrounded by silver stars and swirls and fuchsia streamers. Your wording details will be arranged as shown. Measures 3-1/2″ wide by 5″ high. Shown with silver/fuchsia inks and combination lettering styles Verdana Regular and Sofia. Single bright white envelopes accompany this save the date card.